Nonetheless, it is where we saw Enda at his best. When you meet him in person, either in a one to one chat or as part of an audience, you realise that Enda genuinely enjoys pressing the flesh. He possesses an ebullient personality, unlike either of his two possible successors, and so he comes across as warm and engaging when encountered personally. This natural ability and skill was also a potential liability. His desire to have something to say to everyone and to do it spontaneously could lead to problems – as our greatest ever Taoiseach, Sean Lemass, famously observed – the danger with such off-the-cuff utterances is “not the little too little, it’s the little too much”. Hence Enda’s occasional problems with the actualité. We saw it again last week in Canada when he mis-remembered discussions about human rights in Saudi Arabia and ended up recounting what he now wished he had said, rather than what he had actually said when sitting with the Princes. One way his team of advisers had come up with to try to curb Enda’s effusive tendencies was to try to keep him to a script. It worked, but only to a certain extent. If they truly wanted him to him under control then all they had to do was to turn on a camera on. Nothing was more guaranteed to make him appear wooden and staid than a TV camera. Whereas many senior politicians only truly come to life when the lights switch on and the cameras start rolling, Enda was the opposite. He shifted down the gears. Gone was the bonhomie and the spontaneity and in its place a stiffness of both language and style. It partly explains why he did not like formal TV debates. It was not his strong suit. But this was not just because of the cameras, it was more than that. Enda is not a details man. Nor is he adept at recalling long tracts of script or prepared lines. This was clear in his head to head party leaders debate with Bertie Ahern in the May 2007 election. During the pre-debate spin Fine Gael had so reduced the expectations for their man that all he had to do was show up and not set the desk on fire for them to claim a draw. On the night, many pundits were in awe of Enda as he seemed to hold his own for about the first twenty minutes of the encounter. I recall a senior party colleague calling me about fifteen minutes into the exchange concerned that Enda was doing so well, but their worry was short lived. By the twenty-minute mark Enda was starting to flag, he was running out of rehearsed material. Meanwhile Bertie, who absorbs and retains facts and figures, was just getting into his stride and used the remaining sixty minutes to leave Enda behind. It was a well written speech, delivered extremely well. At several junctures, he seemed not to be reading it from a script, but rather delivering it extemporaneously. What just about stopped it from being a perfect speech, was the inclusion of the oft made, but inaccurate, claim that his government achieved the whole recovery by itself – conveniently omitting the reality that two thirds of the correctives had been made by the time he arrived in office, but old habits die hard, I suppose. In a few week’s (or months) time I will miss having Enda to kick around. I may have a few others to miss too from around the Cabinet table. 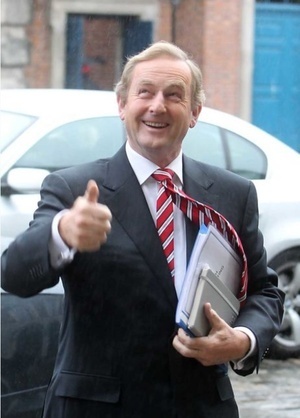 Instead I will have to focus on the possible successors: Simon, the Enda 2.0 or Leo, the anti-Enda. Remarkably, both come to the threshold of high office with considerably more ministerial experience than Enda did when he won the leadership. But while both have many years more time spent around the Cabinet table, they come without Enda’s experience of political hard knocks. Their political paths have been charmed and uneventful, well they have certainly been devoid of any great track record or achievement. Both will doubtless enjoy a political honeymoon and may even feel tempted to capitalise on it with a snap election – whether they will have that opportunity may well be determined by just how down and dirty the race to succeed Enda gets and how much damage will have to be repaired before facing out to meet the voters.